If nothing else, NBC’s Timeless makes it quite easy to crack wise about its uneven—to put it mildly—pilot. It opens with the Hindenburg disaster, which the show attributes to wet ropes, an electrostatic charge, and a buildup of hydrogen. This scene conveniently sets up all kinds of punchlines and metaphors, if gallows humor is your thing. The introduction isn’t a total failure, buoyed as it is by a strong and charming cast. But the design is flawed, or rather, the show is overdesigned—the sci-fi, action, and drama elements don’t fit together seamlessly. Rather than zipping through time periods, Timeless lumbers like Victor Frankenstein’s creation. It’s all still technically sci-fi, but faint praise is no way to trumpet a series’ arrival. The individual aesthetics of seasoned TV producers Shawn Ryan and Eric Kripke are evident in the concept of the show, which is part procedural, part sci-fi adventure. Ryan and Kripke have acquitted themselves well in their respective genres; they’ve both helmed long-running series (The Shield and Supernatural, respectively). They’ve also each suffered the disappointment of a short-lived and underappreciated series—Terriers for Ryan (which he produced), and Revolution for Kripke. 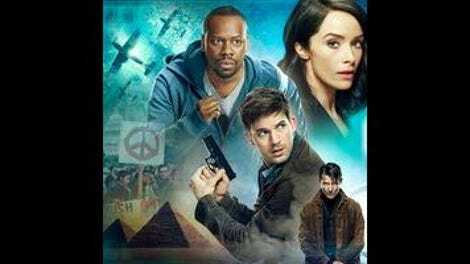 In Timeless, they’ve tried to blend grit and wonder, and while this mix proves somewhat explosive, the resulting conflagration eats away at the story rather than igniting a deeper interest. The kitchen-sink approach weighs down the action early on in the pilot, which again, opens with someone musing about the unwieldiness of the marvel they’re witnessing. (There are several lines of dialogue that archly drive home the beats of the story, but this one’s presumably unintentional.) Then it’s on to introducing Lucy Preston (Abigail Spencer), a hip, attractive history professor who might be in the right time, but not the right place. She’s burdened with living up to her ailing mother’s reputation at her school’s history or anthropology department—hell, it could be the entire humanities division, given how impressed everyone is upon meeting Lucy and hearing about her mother. The stakes are usually high in any time travel-based property, whether these ramifications are personal or global. Marty McFly, for example, started off trying to ensure his own continued existence before being tasked with saving the world from the tyrannical Tannens. But that dark timeline was the result of McFly’s own futzing about with the space-time continuum. Such is the case with Timeless, as the team—which includes Lucy, Sgt. Wyatt Logan (Matt Lanter), and engineer Rufus Carlin (Malcolm Barrett)—learns that altering the past can affect the future in unpredictable and undesirable ways. The trio is conscripted after Garcia Flynn (Goran Visnjic) steals one of inventor Mason Lark’s time machines (the Mothership); the other, a prototype (the Lifeboat), becomes their dimension-bending vehicle. But they also have ulterior motives: Lucy’s swayed by a government agent’s appeal to her “love of history,” there’s something in Matt’s past he’d like to change, and Rufus is doing Lark’s bidding (and maybe just getting away from his underground bunker of a workplace). Flynn slips through their fingers in the pilot, naturally, but the game is afoot—that is, it will pick up whenever he decides to try to rewrite history for his own nefarious purposes again. That stop-and-start motion of the pilot will seemingly power the rest of the season, as the good and bad guys must return to their homebase, i.e., the present, before heading out on another mission. In this and other respects, Timeless recalls Doctor Who, perhaps the grandfather of time-travel series. Lucy & Co. are both the Doctor and his companions, compelled to travel through time while also having good reason to stay put. They dream of bigger things than their day jobs, but they’re also grounded by their connections (of varying allure) to Earth. But the villainous Flynn is another stand-in for the time lord; he’s also a madman with a box—er, orb. He and Abigail have some unknown (to her) connection, a dynamic that’s reminiscent of the Doctor and River Song’s. Flynn lords information over Abigail, but stops short of saying “spoilers.” This relationship is also forged between the show and its viewers, who must deal with all kinds of teases in the pilot, from Mason Lark’s intentions for his time machine to the real reason behind Abigail’s recruitment. This kind of table setting is commonplace for a pilot, but any mystique is too often ripped away by a bit of exposition or backstory that telegraphs a character’s intentions or future actions. A mystery will need to be solved almost every week, as the Lifeboat crew must figure out where Flynn’s headed, though they’ll usually know when. But Timeless shouldn’t be quite so efficient at answering its own riddles, not if it wants to maintain viewer interest. Unfortunately, the procedural aspect of the show necessitates such expediency. Ryan’s previous work in the genre managed to soar above the rest of its offerings, but here it just bogs down the headier sci-fi themes. Which takes us back to the series opening, and the once-unimaginable object that failed to remain aloft.